Protests in Ferguson, Missouri and across the United States following the death of Michael Brown revealed something far deeper than a passionate display of age-old racial frustrations. They unveiled a public chasm that has been growing for years, as America has consistently and intentionally denied significant segments of its population access to full freedom and prosperity. 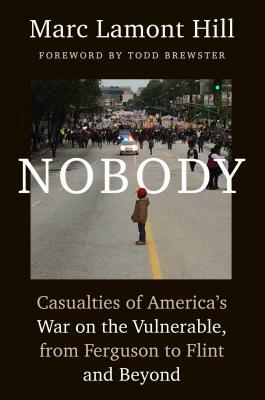 In Nobody, scholar and journalist Marc Lamont Hill presents a powerful and thought-provoking analysis of race and class by examining a growing crisis in America: the existence of a group of citizens who are made vulnerable, exploitable and disposable through the machinery of unregulated capitalism, public policy, and social practice. These are the people considered “Nobody” in contemporary America. Through on-the-ground reporting and careful research, Hill shows how this Nobody class has emerged over time and how forces in America have worked to preserve and exploit it in ways that are both humiliating and harmful. To make his case, Hill carefully reconsiders the details of tragic events like the deaths of Michael Brown, Sandra Bland, and Freddie Gray, and the water crisis in Flint, Michigan. He delves deeply into a host of alarming trends including mass incarceration, overly aggressive policing, broken court systems, shrinking job markets, and the privatization of public resources, showing time and time again the ways the current system is designed to worsen the plight of the vulnerable. Timely and eloquent, Nobody is a keen observation of the challenges and contradictions of American democracy, a must-read for anyone wanting to better understand the race and class issues that continue to leave their mark on our country today.